The Coordinating Unit of the Association of Persons with Disabilities, CUAPWD, in the Southwest region of Cameroon has slammed friends and colleagues who take advantage of their disability, to engage in begging, as a means of making money. The call was made at Mountain Hotel Buea, during the maiden edition of the inclusive special Christmas celebration under the theme “Come and Experience the Power of Love”. The President of the Coordinating Unit of Associations of Persons with Disabilities (CUAPWD) in the Southwest region, Mr Agbor Valery Orock cautioned persons with disabilities to shun begging on roadsides. The event had in attendance, the representative of the Nigerian Consulate to the Northwest and Southwest regions of Cameroon, Mr B.B Bukar, who compared the two systems and encouraged persons with disabilities (PWDs) in the Southwest region to continue with the initiative. He explained that those in Nigeria started like their friends in Cameroon, and now the presidency of Nigeria has two persons with disabilities as advisers to the Nigerian President. Representing the Divisional Officer of Buea, Mr Kome Elvis cautioned PWDs in the Southwest not take advantage of their situation, but work to show society what they can do. ‘‘The government is not actually giving persons with disabilities fish but instead showing them how to catch fish,” he added. On his part as a high participant, Dr Charles Rimnyuy decried society’s approach to persons with disability. To him, if people’s perception about persons with disabilities is changed, then inclusiveness will be highly respected. 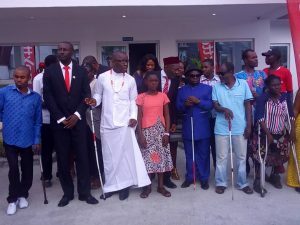 Among the participants was also Nsuh Patrick, popularly known as ‘‘the good old Patrick,’’ who is a person with visual impairment. Mr Nsuh shared the view of others that disability is not inability. He averred that persons with disabilities face challenges in government structures, as some of the buildings are not inclusive. The president, Mr Agbor called on colleagues to submit their projects early so that they can be transmitted to appropriate quarters for funding. According to the Personal Private Assistant of the president, Edith M. Sameh, a teacher by profession, the reason behind the celebration was to bring together persons with disabilities to celebrate Christmas, since some might not celebrate on the day proper. She added that the event was the first, furthering that it will definitely continue in future. The event was coloured by special gospel songs composed by persons with disabilities as an affirmation that disability is not inability. The Main sponsors of the event, Nexttel Cameroun offered some T-shirts, caps and other items. Mbuh Lucy, the President of the Association of Persons with Disabilities in the University of Buea said it was an opportunity to spend Christmas together with friends. ‘‘This is also about getting experience, sharing love and networking,” she noted. I’m also writing to let you be aware of of the extraordinary encounter our child obtained browsing your web page. She noticed so many things, which include how it is like to have an ideal giving heart to get the others really easily learn several specialized subject matter. You undoubtedly did more than her expectations. Thanks for displaying the essential, healthy, edifying not to mention fun tips about the topic to Lizeth. Thank you a lot for providing individuals with an extremely terrific chance to check tips from this site. It really is very pleasurable and also packed with a good time for me and my office acquaintances to search your web site at the very least 3 times weekly to read through the newest stuff you will have. And of course, I am just certainly fulfilled considering the breathtaking techniques served by you. Some two facts on this page are essentially the very best I’ve ever had. I as well as my buddies were actually going through the excellent tricks located on the website then immediately came up with an awful feeling I never thanked the site owner for those secrets. Those people were definitely for this reason stimulated to see all of them and now have extremely been taking pleasure in these things. I appreciate you for simply being well considerate and for making a choice on this kind of fine resources millions of individuals are really desirous to understand about. My honest apologies for not saying thanks to you sooner. I intended to draft you that very little remark in order to give thanks again for all the breathtaking basics you have discussed at this time. This has been so surprisingly open-handed with you to give without restraint just what a few individuals could possibly have offered for sale as an electronic book to generate some bucks for their own end, certainly given that you could possibly have done it if you ever desired. These ideas likewise acted to become easy way to be certain that someone else have similar fervor just as my own to know great deal more in terms of this matter. I know there are numerous more fun times up front for people who discover your website. I precisely wished to appreciate you all over again. I am not sure what I might have used without those solutions provided by you concerning such situation. It became a very depressing scenario in my opinion, however , looking at your expert avenue you solved that made me to cry with gladness. Now i am thankful for the assistance and in addition hope that you know what a powerful job you happen to be putting in instructing the others via a blog. I am certain you have never come across all of us. I wanted to construct a simple comment to be able to express gratitude to you for these remarkable guides you are sharing at this website. My time intensive internet investigation has now been rewarded with high-quality content to write about with my best friends. I would point out that we site visitors actually are undoubtedly endowed to dwell in a very good website with many wonderful individuals with good hints. I feel very lucky to have come across your entire website page and look forward to so many more fabulous minutes reading here. Thanks once again for a lot of things. Thank you for all of your work on this web site. Kate take interest in working on investigation and it’s really easy to understand why. We hear all relating to the dynamic manner you create very helpful tips and hints via this web blog and as well recommend participation from other individuals about this issue plus our daughter is now studying so much. Take pleasure in the rest of the new year. You’re the one performing a glorious job. I have to express my affection for your kind-heartedness giving support to people who actually need assistance with this important concern. Your special commitment to getting the solution across had been amazingly significant and have in most cases empowered some individuals much like me to achieve their goals. Your amazing invaluable information entails so much to me and still more to my fellow workers. Regards; from all of us. My wife and i were really delighted when Emmanuel could round up his basic research from the precious recommendations he came across through your web site. It’s not at all simplistic just to possibly be giving freely secrets and techniques that many many people may have been selling. We consider we have got the website owner to give thanks to for this. The most important explanations you made, the straightforward website menu, the relationships you make it possible to create – it’s mostly spectacular, and it is aiding our son and us do think the article is amusing, and that is wonderfully essential. Thanks for the whole thing! My spouse and i have been so comfortable that Michael could complete his survey with the precious recommendations he gained when using the blog. It is now and again perplexing just to continually be giving out guidance which usually others may have been selling. And now we grasp we have you to be grateful to because of that. The explanations you’ve made, the simple blog menu, the relationships you can make it possible to create – it’s all spectacular, and it’s really assisting our son in addition to the family understand this idea is cool, and that’s exceedingly indispensable. Thanks for all the pieces! My spouse and i were absolutely comfortable when Michael could carry out his homework through the ideas he had using your blog. It is now and again perplexing to just find yourself making a gift of tips that people today might have been trying to sell. So we do know we need the website owner to thank for this. Most of the illustrations you’ve made, the straightforward blog navigation, the friendships you will aid to instill – it is mostly astounding, and it’s letting our son in addition to our family feel that that subject matter is pleasurable, which is certainly wonderfully indispensable. Thank you for everything! A lot of thanks for all of your work on this blog. Ellie enjoys going through investigation and it’s easy to see why. My partner and i notice all about the powerful ways you create advantageous techniques through the website and foster contribution from some other people on this matter while our own simple princess is certainly studying so much. Take advantage of the remaining portion of the year. You’re conducting a first class job. I just wanted to write down a simple comment to express gratitude to you for some of the unique guidelines you are writing on this site. My long internet lookup has at the end been honored with excellent content to go over with my companions. I ‘d say that many of us website visitors actually are undoubtedly blessed to live in a fantastic site with so many awesome professionals with helpful tips and hints. I feel very much lucky to have come across your web page and look forward to tons of more awesome times reading here. Thanks a lot once again for all the details. I precisely wished to thank you very much again. I’m not certain the things that I could possibly have tried in the absence of the type of information discussed by you about that topic. This has been an absolute scary dilemma in my circumstances, but encountering the specialized strategy you resolved it took me to leap over delight. I will be happy for this guidance and even believe you are aware of a great job that you are getting into teaching some other people all through a web site. Probably you’ve never come across any of us. Thanks a lot for giving everyone an exceptionally wonderful opportunity to discover important secrets from this site. It can be so beneficial and also stuffed with a good time for me personally and my office mates to search your site at minimum three times in a week to see the newest secrets you have got. And lastly, we’re at all times happy with all the amazing principles you give. Selected 2 tips on this page are really the most impressive I’ve had. I am glad for commenting to let you understand of the superb encounter my friend’s daughter encountered using your blog. She figured out a wide variety of pieces, not to mention how it is like to have a wonderful helping heart to have other individuals completely learn about chosen impossible matters. You really surpassed my expected results. Many thanks for coming up with the powerful, trusted, explanatory and as well as easy thoughts on that topic to Sandra. I just wanted to develop a simple message to express gratitude to you for the wonderful recommendations you are giving on this site. My long internet search has at the end been compensated with beneficial points to write about with my classmates and friends. I ‘d state that that we site visitors are really endowed to be in a useful site with so many lovely individuals with valuable guidelines. I feel pretty blessed to have encountered the webpage and look forward to plenty of more enjoyable minutes reading here. Thanks again for everything. I simply desired to appreciate you yet again. I’m not certain what I would have worked on in the absence of those advice shown by you regarding such a theme. It has been a troublesome problem in my position, but considering this expert avenue you dealt with the issue made me to leap with delight. I am just happy for this assistance and as well , wish you really know what a great job you happen to be providing training people by way of your webblog. Most likely you’ve never come across all of us. I simply had to appreciate you once more. I am not sure the things I might have tried in the absence of the entire ideas revealed by you regarding this field. It was actually an absolute horrifying situation for me, however , observing your expert mode you resolved that forced me to cry over joy. I am just thankful for your work and as well , sincerely hope you find out what a powerful job you have been getting into training other individuals through a site. Most probably you’ve never encountered any of us. Thank you so much for providing individuals with a very wonderful possiblity to read from this web site. It is often so superb and also packed with amusement for me and my office acquaintances to search the blog more than three times per week to study the latest secrets you have. Not to mention, I am also always astounded considering the striking principles you serve. Selected 4 areas in this article are clearly the most efficient we have all ever had. I really wanted to compose a small comment to be able to express gratitude to you for some of the unique steps you are showing at this site. My considerable internet look up has at the end been rewarded with wonderful know-how to exchange with my family members. I ‘d assert that we website visitors actually are really blessed to be in a really good place with many brilliant people with very beneficial plans. I feel pretty lucky to have come across the webpages and look forward to tons of more entertaining times reading here. Thanks a lot once more for all the details. I truly wanted to type a small message to appreciate you for all of the amazing guides you are showing at this site. My time consuming internet investigation has at the end of the day been paid with beneficial facts and strategies to write about with my colleagues. I would mention that most of us visitors actually are really blessed to exist in a useful network with so many outstanding professionals with very helpful strategies. I feel truly fortunate to have encountered the site and look forward to really more brilliant moments reading here. Thank you once again for all the details. My husband and i have been quite thrilled when Edward could do his basic research via the precious recommendations he had when using the web pages. It is now and again perplexing to simply be giving freely things some others might have been making money from. And we all grasp we need the blog owner to give thanks to because of that. The explanations you have made, the simple website menu, the friendships you will help instill – it’s got everything awesome, and it’s aiding our son in addition to us do think this content is thrilling, which is certainly truly serious. Many thanks for all! I wish to show my admiration for your kind-heartedness giving support to individuals that must have help with this field. Your real commitment to getting the message all around became pretty beneficial and has constantly empowered associates much like me to attain their aims. Your personal invaluable publication can mean a lot a person like me and much more to my peers. With thanks; from all of us. I have to express thanks to this writer for rescuing me from such a problem. Because of researching throughout the the net and finding advice which are not powerful, I figured my entire life was gone. Existing without the strategies to the difficulties you have sorted out as a result of this website is a crucial case, and ones which may have in a wrong way affected my career if I had not noticed your blog post. The know-how and kindness in handling every aspect was invaluable. I’m not sure what I would’ve done if I had not discovered such a subject like this. It’s possible to at this point relish my future. Thanks so much for this professional and results-oriented help. I won’t hesitate to endorse the website to anyone who needs counselling about this problem. I simply want to say I am newbie to weblog and truly enjoyed you’re web blog. More than likely I’m want to bookmark your blog post . You amazingly come with superb posts. Kudos for sharing your web-site. My husband and i felt really cheerful that Raymond could conclude his analysis using the precious recommendations he gained from your very own blog. It’s not at all simplistic just to find yourself releasing facts that the others could have been making money from. And now we see we’ve got the website owner to give thanks to for that. The illustrations you’ve made, the simple website navigation, the relationships you make it easier to create – it’s many extraordinary, and it’s letting our son in addition to us recognize that this issue is cool, which is highly fundamental. Thanks for all the pieces! I would like to express some appreciation to this writer for rescuing me from this particular scenario. Because of checking throughout the internet and getting principles which are not powerful, I assumed my life was well over. Existing devoid of the answers to the issues you’ve resolved by means of this report is a serious case, as well as ones that would have in a negative way affected my career if I had not come across your website. The ability and kindness in handling every aspect was tremendous. I don’t know what I would have done if I had not encountered such a stuff like this. It’s possible to now look ahead to my future. Thanks for your time so much for the impressive and amazing guide. I will not hesitate to refer your blog to any individual who will need counselling on this subject. I definitely wanted to post a quick word in order to thank you for all of the stunning instructions you are posting at this website. My time-consuming internet research has at the end of the day been rewarded with useful content to exchange with my partners. I ‘d suppose that we readers are undeniably blessed to dwell in a great website with many wonderful people with beneficial plans. I feel very much happy to have discovered the web pages and look forward to really more brilliant moments reading here. Thank you once again for a lot of things. Usually I do not learn article on blogs, but I would like to say that this write-up very pressured me to check out and do so! Your writing taste has been amazed me. Thank you, quite nice post. I will right away grab your rss as I can not in finding your email subscription hyperlink or e-newsletter service. Do you have any? Please allow me understand in order that I may just subscribe. Thanks. fantastic points altogether, you just received a new reader. What would you recommend about your publish that you simply made a few days in the past? Any positive? I simply want to say I am very new to weblog and truly enjoyed you’re blog site. Most likely I’m likely to bookmark your blog post . You really come with perfect article content. Thanks a bunch for sharing with us your web-site. Thank you for sharing superb informations. Your web site is very cool. I am impressed by the details that you have on this site. It reveals how nicely you perceive this subject. Bookmarked this web page, will come back for extra articles. You, my pal, ROCK! I found just the information I already searched everywhere and just couldn’t come across. What an ideal website. certainly like your web-site but you need to test the spelling on several of your posts. Many of them are rife with spelling problems and I in finding it very bothersome to tell the truth then again I¡¦ll definitely come again again. Thanks for every one of your efforts on this site. Kim really loves doing investigations and it’s really easy to see why. Most people hear all relating to the compelling manner you convey vital tips on this website and as well as cause participation from people on this concept then our daughter is in fact studying a whole lot. Have fun with the rest of the new year. You’re the one conducting a glorious job. I in addition to my friends happened to be studying the nice advice from your web page and then all of the sudden I got an awful suspicion I never expressed respect to the site owner for those secrets. All the ladies appeared to be for this reason thrilled to see all of them and have in effect very much been taking pleasure in these things. Thanks for really being indeed thoughtful as well as for pick out this kind of quality subject matter millions of individuals are really desperate to know about. My very own honest regret for not expressing gratitude to you sooner. Valuable info. Fortunate me I discovered your web site accidentally, and I am stunned why this twist of fate did not came about in advance! I bookmarked it. Hi there. I discovered your site by way of Google at the same time as searching for a related subject, your web site came up. It appears to be good. I’ve bookmarked it in my google bookmarks to visit then. Hello there. I discovered your web site by means of Google while looking for a similar topic, your site came up. It appears to be good. I have bookmarked it in my google bookmarks to come back then. Hiya, I’m really glad I have found this information. Today bloggers publish just about gossip and internet stuff and this is really frustrating. A good site with interesting content, this is what I need. Thanks for making this web site, and I’ll be visiting again. Do you do newsletters by email? value bookmarking for revisiting. I wonder how much effort you set to create such a wonderful informative site. Hiya, I am really glad I’ve found this information. Today bloggers publish only about gossip and web stuff and this is really irritating. A good web site with interesting content, that’s what I need. Thank you for making this web-site, and I’ll be visiting again. Do you do newsletters by email? Hiya, I’m really glad I have found this info. Today bloggers publish only about gossip and web stuff and this is really irritating. A good web site with interesting content, this is what I need. Thanks for making this web-site, and I will be visiting again. Do you do newsletters by email? Hey there. I discovered your site by means of Google whilst looking for a similar matter, your site got here up. It seems great. I have bookmarked it in my google bookmarks to visit then. Hey there. I found your blog by way of Google whilst looking for a comparable topic, your web site came up. It appears to be good. I’ve bookmarked it in my google bookmarks to visit then. Hi there. I discovered your website via Google even as looking for a similar topic, your website came up. It looks great. I’ve bookmarked it in my google bookmarks to come back then. Hi there. I discovered your website by means of Google while searching for a comparable topic, your site got here up. It looks good. I have bookmarked it in my google bookmarks to come back then. Hi there. I found your blog by way of Google whilst looking for a related subject, your web site got here up. It seems good. I’ve bookmarked it in my google bookmarks to come back then. Hiya, I’m really glad I’ve found this info. Nowadays bloggers publish just about gossip and web stuff and this is really frustrating. A good blog with interesting content, that is what I need. Thanks for making this site, and I’ll be visiting again. Do you do newsletters by email? I just wanted to make a quick word in order to say thanks to you for those splendid recommendations you are giving here. My extensive internet investigation has now been recognized with reliable facts and strategies to go over with my companions. I ‘d express that we readers are truly lucky to be in a wonderful network with very many brilliant people with beneficial points. I feel pretty blessed to have seen your weblog and look forward to plenty of more fabulous times reading here. Thanks a lot once more for everything. Wow, awesome blog layout! How long have you been blogging for? you made blogging glance easy. The whole look of your web site is excellent, as well as the content material! whoah this blog is wonderful i love studying your posts. Stay up the great work! You already know, lots of persons are hunting round for this information, you can aid them greatly. whoah this weblog is wonderful i love studying your posts. Stay up the great work! You recognize, lots of individuals are searching around for this information, you can aid them greatly. Just desire to say your article is as astounding. The clarity in your post is simply cool and i can assume you’re an expert on this subject. Well with your permission let me to grab your RSS feed to keep updated with forthcoming post. Thanks a million and please keep up the enjoyable work. Hello there. I discovered your website by way of Google even as looking for a comparable topic, your website came up. It seems to be good. I have bookmarked it in my google bookmarks to visit then. I am writing to let you know what a useful encounter my child encountered reading your web page. She figured out a lot of issues, most notably how it is like to possess a marvelous giving style to have many people really easily learn various tricky subject areas. You truly surpassed our own expectations. Thank you for imparting the informative, healthy, edifying and cool thoughts on the topic to Ethel. Hello there. I found your web site by the use of Google while searching for a related subject, your site got here up. It appears to be good. I have bookmarked it in my google bookmarks to visit then. Hiya, I’m really glad I’ve found this info. Nowadays bloggers publish only about gossip and net stuff and this is really irritating. A good web site with exciting content, that’s what I need. Thanks for making this site, and I’ll be visiting again. Do you do newsletters by email? Hello there. I found your website by way of Google while searching for a similar matter, your site came up. It looks great. I’ve bookmarked it in my google bookmarks to come back then. Hiya, I am really glad I have found this info. Today bloggers publish only about gossip and internet stuff and this is actually irritating. A good blog with exciting content, that is what I need. Thank you for making this web-site, and I’ll be visiting again. Do you do newsletters by email? Hiya, I’m really glad I’ve found this info. Today bloggers publish just about gossip and internet stuff and this is really annoying. A good site with interesting content, that is what I need. Thanks for making this website, and I will be visiting again. Do you do newsletters by email? Hello there. I discovered your site via Google whilst looking for a related topic, your site got here up. It seems good. I’ve bookmarked it in my google bookmarks to visit then. Hey there. I discovered your blog by means of Google whilst searching for a related matter, your website got here up. It seems good. I’ve bookmarked it in my google bookmarks to visit then. I have to convey my gratitude for your kindness for all those that really need help with that concept. Your real dedication to getting the message throughout ended up being rather helpful and have continuously enabled others much like me to arrive at their targets. Your own useful guideline indicates a lot a person like me and even more to my office colleagues. Regards; from all of us. Hello there. I found your website by the use of Google even as looking for a comparable subject, your site came up. It seems to be good. I’ve bookmarked it in my google bookmarks to come back then. Hey there. I found your website by the use of Google at the same time as looking for a comparable matter, your web site came up. It looks good. I’ve bookmarked it in my google bookmarks to come back then. Hiya, I’m really glad I’ve found this information. Nowadays bloggers publish just about gossip and internet stuff and this is really frustrating. A good web site with interesting content, that’s what I need. Thanks for making this site, and I will be visiting again. Do you do newsletters by email? Hi there. I discovered your site by way of Google while searching for a similar matter, your website got here up. It seems to be good. I’ve bookmarked it in my google bookmarks to come back then. Hiya, I am really glad I have found this info. Nowadays bloggers publish only about gossip and internet stuff and this is actually annoying. A good website with interesting content, that is what I need. Thanks for making this site, and I’ll be visiting again. Do you do newsletters by email? Hello there. I discovered your website by way of Google at the same time as searching for a similar topic, your web site came up. It seems great. I have bookmarked it in my google bookmarks to come back then. Hiya, I’m really glad I have found this info. Today bloggers publish only about gossip and net stuff and this is really frustrating. A good blog with exciting content, that’s what I need. Thanks for making this site, and I’ll be visiting again. Do you do newsletters by email? Hiya, I am really glad I’ve found this information. Today bloggers publish only about gossip and net stuff and this is actually annoying. A good website with exciting content, that is what I need. Thank you for making this site, and I’ll be visiting again. Do you do newsletters by email? Hiya, I am really glad I have found this information. Nowadays bloggers publish only about gossip and internet stuff and this is really irritating. A good blog with exciting content, that’s what I need. Thank you for making this web-site, and I will be visiting again. Do you do newsletters by email? Hey there. I found your site via Google at the same time as looking for a similar topic, your site came up. It seems to be good. I’ve bookmarked it in my google bookmarks to come back then. Hey there. I found your site by means of Google whilst searching for a comparable matter, your website came up. It appears to be good. I have bookmarked it in my google bookmarks to come back then. Hi there. I discovered your blog by way of Google whilst searching for a similar subject, your site came up. It seems to be great. I’ve bookmarked it in my google bookmarks to visit then. Hey there. I found your blog by way of Google whilst searching for a related topic, your web site came up. It looks good. I’ve bookmarked it in my google bookmarks to come back then. Hiya, I’m really glad I’ve found this information. Nowadays bloggers publish only about gossip and internet stuff and this is actually annoying. A good blog with exciting content, this is what I need. Thank you for making this website, and I will be visiting again. Do you do newsletters by email? Hey there. I discovered your website by the use of Google at the same time as looking for a comparable topic, your site came up. It looks great. I have bookmarked it in my google bookmarks to visit then. Hiya, I’m really glad I’ve found this information. Nowadays bloggers publish only about gossip and internet stuff and this is actually frustrating. A good website with exciting content, that’s what I need. Thank you for making this site, and I will be visiting again. Do you do newsletters by email? Hi there. I discovered your blog by way of Google even as looking for a related topic, your website came up. It seems to be great. I’ve bookmarked it in my google bookmarks to come back then. Hey there. I found your website by the use of Google whilst looking for a related matter, your site got here up. It looks great. I’ve bookmarked it in my google bookmarks to come back then. Hiya, I am really glad I have found this information. Today bloggers publish only about gossip and web stuff and this is actually annoying. A good site with interesting content, this is what I need. Thank you for making this site, and I will be visiting again. Do you do newsletters by email? Hi there. I found your website via Google whilst looking for a related matter, your site got here up. It appears to be good. I have bookmarked it in my google bookmarks to visit then. Hi there. I discovered your website by means of Google even as looking for a similar matter, your website came up. It appears to be great. I’ve bookmarked it in my google bookmarks to come back then. Hello there. I discovered your blog by way of Google while searching for a related topic, your web site came up. It appears to be great. I have bookmarked it in my google bookmarks to come back then. Hi there. I discovered your web site by way of Google while looking for a similar matter, your website came up. It appears to be good. I’ve bookmarked it in my google bookmarks to come back then. Hi there. I found your website by the use of Google while searching for a similar subject, your web site came up. It seems to be good. I have bookmarked it in my google bookmarks to come back then. Wow, superb weblog format! How long have you been blogging for? you made blogging glance easy. The entire look of your site is great, let alone the content material! I wanted to write you one very little observation just to thank you so much once again just for the lovely ideas you have shown on this site. It was quite incredibly open-handed with people like you in giving without restraint what exactly a number of us would have offered as an electronic book to earn some profit on their own, principally seeing that you could possibly have done it in the event you decided. Those good ideas as well worked as a good way to be certain that other people have similar zeal really like mine to figure out very much more concerning this matter. I believe there are several more pleasant situations ahead for people who looked at your blog. You actually make it seem so easy together with your presentation but I find this topic to be actually something that I think I’d by no means understand. It kind of feels too complex and extremely huge for me. I am taking a look forward in your next submit, I will attempt to get the dangle of it! you’re really a excellent webmaster. The website loading velocity is incredible. It sort of feels that you’re doing any distinctive trick. Moreover, The contents are masterwork. you have done a great activity on this subject! Hi there. I discovered your web site by way of Google at the same time as looking for a comparable topic, your website came up. It looks good. I’ve bookmarked it in my google bookmarks to visit then. Hi there. I found your blog by the use of Google whilst looking for a related topic, your site got here up. It seems to be good. I’ve bookmarked it in my google bookmarks to come back then. Hiya, I’m really glad I’ve found this info. Today bloggers publish just about gossip and net stuff and this is really irritating. A good blog with interesting content, this is what I need. Thanks for making this site, and I’ll be visiting again. Do you do newsletters by email? Hey there. I found your site by the use of Google whilst searching for a related matter, your web site came up. It appears to be good. I have bookmarked it in my google bookmarks to visit then. Wow, wonderful weblog layout! How long have you ever been blogging for? you made running a blog glance easy. The whole glance of your web site is magnificent, as smartly as the content! Hi there. I found your web site by way of Google at the same time as looking for a similar matter, your site came up. It appears to be good. I have bookmarked it in my google bookmarks to visit then. I simply want to mention I’m very new to weblog and honestly liked you’re page. Likely I’m going to bookmark your blog post . You absolutely have terrific posts. Kudos for revealing your blog. Hi there. I found your blog by means of Google even as looking for a related matter, your website got here up. It appears to be great. I’ve bookmarked it in my google bookmarks to visit then. Hi there. I found your site by the use of Google while looking for a similar matter, your site came up. It seems to be good. I’ve bookmarked it in my google bookmarks to come back then. Hiya, I am really glad I’ve found this info. Nowadays bloggers publish only about gossip and web stuff and this is really annoying. A good site with interesting content, that’s what I need. Thanks for making this web-site, and I’ll be visiting again. Do you do newsletters by email? Thank you, I’ve just been looking for information about this subject for a long time and yours is the greatest I have came upon till now. But, what concerning the bottom line? Are you certain about the source? Hiya, I’m really glad I’ve found this information. Nowadays bloggers publish just about gossip and web stuff and this is really frustrating. A good blog with interesting content, this is what I need. Thank you for making this web-site, and I will be visiting again. Do you do newsletters by email? Hello there. I found your website by the use of Google while searching for a related topic, your site got here up. It looks great. I have bookmarked it in my google bookmarks to come back then. Hi there. I discovered your blog by way of Google even as looking for a comparable matter, your web site came up. It looks great. I’ve bookmarked it in my google bookmarks to visit then. Hi there. I found your site by means of Google while looking for a similar subject, your web site came up. It appears to be great. I have bookmarked it in my google bookmarks to visit then. Hi there. I discovered your website by the use of Google at the same time as looking for a related subject, your web site got here up. It appears to be great. I have bookmarked it in my google bookmarks to visit then. Hey there. I found your website by way of Google at the same time as searching for a similar subject, your site got here up. It looks good. I’ve bookmarked it in my google bookmarks to come back then. It is actually a nice and useful piece of info. I am happy that you just shared this useful info with us. Please keep us informed like this. Thank you for sharing. Hiya, I am really glad I’ve found this information. Today bloggers publish only about gossip and web stuff and this is actually irritating. A good blog with interesting content, that is what I need. Thank you for making this site, and I will be visiting again. Do you do newsletters by email? Hey there. I found your website by means of Google at the same time as looking for a similar subject, your web site got here up. It appears great. I have bookmarked it in my google bookmarks to come back then. Hey there. I found your site via Google while looking for a comparable topic, your website came up. It seems to be good. I’ve bookmarked it in my google bookmarks to visit then. Hello there. I found your blog by the use of Google while looking for a comparable matter, your website came up. It looks great. I’ve bookmarked it in my google bookmarks to come back then. Hey there. I found your site via Google whilst searching for a similar topic, your website got here up. It appears to be great. I have bookmarked it in my google bookmarks to come back then. Great post. I was checking continuously this blog and I’m impressed! Very helpful info specifically the last part 🙂 I care for such info a lot. I was seeking this certain information for a long time. Thank you and best of luck. Hiya, I’m really glad I’ve found this info. Today bloggers publish just about gossip and web stuff and this is actually annoying. A good site with interesting content, this is what I need. Thanks for making this web site, and I will be visiting again. Do you do newsletters by email? Hi there. I discovered your website by means of Google at the same time as searching for a comparable matter, your site got here up. It appears good. I have bookmarked it in my google bookmarks to visit then. Hi there. I found your website by means of Google whilst searching for a related topic, your web site came up. It appears to be great. I’ve bookmarked it in my google bookmarks to visit then. Hey there. I found your web site via Google whilst searching for a similar topic, your site came up. It seems good. I’ve bookmarked it in my google bookmarks to visit then. Hey there. I found your blog by means of Google while looking for a comparable topic, your web site came up. It looks good. I’ve bookmarked it in my google bookmarks to come back then. Hello there. I discovered your site via Google whilst searching for a comparable subject, your site came up. It seems to be good. I have bookmarked it in my google bookmarks to visit then. Hiya, I am really glad I have found this info. Today bloggers publish only about gossip and internet stuff and this is really annoying. A good web site with interesting content, that is what I need. Thank you for making this site, and I’ll be visiting again. Do you do newsletters by email? Hello there. I found your site by way of Google whilst looking for a comparable matter, your website came up. It looks great. I have bookmarked it in my google bookmarks to come back then. Hello there. I discovered your web site by means of Google whilst looking for a related topic, your site came up. It appears to be great. I’ve bookmarked it in my google bookmarks to come back then. Hi there. I discovered your site by means of Google whilst looking for a similar topic, your web site got here up. It seems great. I have bookmarked it in my google bookmarks to come back then. Hiya, I’m really glad I’ve found this information. Today bloggers publish just about gossip and web stuff and this is really annoying. A good web site with exciting content, this is what I need. Thank you for making this site, and I’ll be visiting again. Do you do newsletters by email? Hiya, I’m really glad I have found this information. Nowadays bloggers publish only about gossip and internet stuff and this is really irritating. A good site with exciting content, this is what I need. Thanks for making this web site, and I will be visiting again. Do you do newsletters by email? Hi! I know this is kinda off topic however I’d figured I’d ask. Would you be interested in trading links or maybe guest writing a blog post or vice-versa? My blog discusses a lot of the same topics as yours and I believe we could greatly benefit from each other. If you are interested feel free to shoot me an email. I look forward to hearing from you! Fantastic blog by the way! Hi there. I found your website via Google while searching for a related matter, your site came up. It seems good. I have bookmarked it in my google bookmarks to come back then. Hi there. I discovered your blog via Google at the same time as looking for a comparable subject, your web site got here up. It seems to be good. I’ve bookmarked it in my google bookmarks to come back then. I¡¦ll right away seize your rss feed as I can’t in finding your email subscription hyperlink or e-newsletter service. Do you’ve any? Kindly permit me recognize in order that I could subscribe. Thanks. Hiya, I am really glad I’ve found this information. Today bloggers publish only about gossip and internet stuff and this is actually irritating. A good website with interesting content, that is what I need. Thank you for making this web-site, and I’ll be visiting again. Do you do newsletters by email? I seriously love your blog.. Pleasant colors & theme. Did you make this website yourself? Please reply back as I’m trying to create my own personal blog and would love to know where you got this from or exactly what the theme is named. Cheers! Hiya, I am really glad I’ve found this information. Nowadays bloggers publish only about gossip and web stuff and this is actually frustrating. A good web site with interesting content, this is what I need. Thanks for making this web-site, and I’ll be visiting again. Do you do newsletters by email? Hello there. I discovered your web site by means of Google at the same time as looking for a similar subject, your site came up. It appears to be great. I have bookmarked it in my google bookmarks to visit then. Hello there. I found your blog by way of Google while searching for a related subject, your web site got here up. It seems great. I’ve bookmarked it in my google bookmarks to come back then. Hey there. I discovered your website by the use of Google whilst looking for a similar matter, your website came up. It looks good. I have bookmarked it in my google bookmarks to visit then. Hey there. I discovered your blog by way of Google at the same time as looking for a similar topic, your website came up. It appears great. I have bookmarked it in my google bookmarks to visit then. Hiya, I am really glad I have found this information. Nowadays bloggers publish just about gossip and web stuff and this is actually frustrating. A good web site with exciting content, this is what I need. Thank you for making this web site, and I will be visiting again. Do you do newsletters by email? Hey there. I found your web site by means of Google while searching for a similar subject, your web site got here up. It looks great. I’ve bookmarked it in my google bookmarks to come back then. Hello there. I discovered your site by the use of Google whilst searching for a comparable topic, your site came up. It seems to be good. I have bookmarked it in my google bookmarks to visit then. Hey there. I found your blog by way of Google while looking for a related subject, your site came up. It appears to be good. I have bookmarked it in my google bookmarks to come back then. Hiya, I am really glad I’ve found this info. Today bloggers publish just about gossip and net stuff and this is actually irritating. A good site with interesting content, this is what I need. Thank you for making this web-site, and I’ll be visiting again. Do you do newsletters by email? Hiya, I am really glad I have found this info. Today bloggers publish just about gossip and net stuff and this is really frustrating. A good website with exciting content, this is what I need. Thank you for making this website, and I’ll be visiting again. Do you do newsletters by email? Hey there. I discovered your blog via Google at the same time as looking for a similar subject, your website came up. It seems good. I’ve bookmarked it in my google bookmarks to come back then. Hey there. I discovered your site by means of Google at the same time as looking for a similar matter, your site got here up. It seems to be great. I’ve bookmarked it in my google bookmarks to come back then. Thank you for every other wonderful post. Where else may just anyone get that kind of information in such a perfect way of writing? I’ve a presentation next week, and I’m on the look for such info. Hi there. I found your blog by way of Google while searching for a comparable matter, your site came up. It appears great. I’ve bookmarked it in my google bookmarks to visit then. Thanks for sharing superb informations. Your site is so cool. I’m impressed by the details that you have on this web site. It reveals how nicely you perceive this subject. Bookmarked this web page, will come back for extra articles. You, my friend, ROCK! I found simply the info I already searched everywhere and just could not come across. What a great web-site. Hey there. I found your blog via Google even as searching for a comparable matter, your site got here up. It appears to be good. I’ve bookmarked it in my google bookmarks to come back then. Hey there. I found your site via Google whilst looking for a comparable matter, your web site got here up. It looks good. I’ve bookmarked it in my google bookmarks to come back then. Hi there. I discovered your site by the use of Google at the same time as looking for a similar topic, your web site got here up. It appears good. I’ve bookmarked it in my google bookmarks to come back then. Hi there. I discovered your blog by the use of Google at the same time as looking for a related subject, your web site came up. It seems good. I’ve bookmarked it in my google bookmarks to come back then. Hey there. I discovered your blog by the use of Google even as searching for a comparable matter, your website got here up. It appears to be good. I have bookmarked it in my google bookmarks to come back then. Hiya, I’m really glad I’ve found this information. Nowadays bloggers publish just about gossip and net stuff and this is actually irritating. A good site with exciting content, that is what I need. Thank you for making this web-site, and I will be visiting again. Do you do newsletters by email? Hi there. I found your blog via Google at the same time as looking for a similar matter, your website came up. It appears great. I have bookmarked it in my google bookmarks to visit then. Hiya, I am really glad I’ve found this information. Today bloggers publish only about gossip and web stuff and this is really irritating. A good web site with interesting content, that’s what I need. Thank you for making this site, and I’ll be visiting again. Do you do newsletters by email? Hey there. I discovered your blog via Google whilst searching for a comparable topic, your site came up. It seems to be great. I have bookmarked it in my google bookmarks to come back then. Awesome post. I am a typical visitor of one’s website and appreciate you finding the time to keep the nice site. I would have been a regular visitor for a really long time. I would actually like to make a blog site however. I’m not sure what type of blog sites obtain the most website traffic? What kind of blogs do you browse? I mostly surf photo blog sites and also style blog sites. Just obtaining a poll below many thanks!. Hiya, I am really glad I’ve found this information. Nowadays bloggers publish just about gossip and net stuff and this is really irritating. A good website with interesting content, that is what I need. Thank you for making this web-site, and I’ll be visiting again. Do you do newsletters by email? Hello there. I found your blog via Google whilst looking for a comparable matter, your website came up. It seems to be great. I’ve bookmarked it in my google bookmarks to come back then. Hey there. I discovered your website by the use of Google even as looking for a similar topic, your site came up. It appears good. I’ve bookmarked it in my google bookmarks to come back then. I am brand-new to blog site memberships as well as I am looking for a simple viewers that is nice and arranged that lets me watch my blogs from my homepage or has a little scrollbox that is always up on the side of the computer system display. I started to utilize bloglines however it is truly messy with all the blog names aligned on the side. Thanks a lot!. Hiya, I am really glad I’ve found this information. Nowadays bloggers publish just about gossip and web stuff and this is really irritating. A good site with exciting content, this is what I need. Thank you for making this web-site, and I’ll be visiting again. Do you do newsletters by email? Hiya, I am really glad I’ve found this info. Nowadays bloggers publish just about gossip and web stuff and this is actually frustrating. A good site with exciting content, this is what I need. Thanks for making this web site, and I will be visiting again. Do you do newsletters by email? Hey there. I discovered your blog via Google while searching for a comparable matter, your website came up. It appears to be great. I’ve bookmarked it in my google bookmarks to visit then. Hey there. I discovered your web site by way of Google even as looking for a similar topic, your web site got here up. It looks great. I’ve bookmarked it in my google bookmarks to come back then. Hey there. I found your web site by way of Google while looking for a comparable subject, your website got here up. It seems to be good. I’ve bookmarked it in my google bookmarks to visit then. Hello there. I discovered your web site via Google at the same time as looking for a related topic, your site came up. It seems good. I’ve bookmarked it in my google bookmarks to visit then. Thanks , I have recently been looking for info approximately this subject for a long time and yours is the greatest I have came upon till now. But, what concerning the conclusion? Are you certain about the supply? I¡¦ve learn a few just right stuff here. Definitely price bookmarking for revisiting. I surprise how so much effort you put to create this kind of magnificent informative site. Great ¡V I should definitely pronounce, impressed with your website. I had no trouble navigating through all tabs and related info ended up being truly easy to do to access. I recently found what I hoped for before you know it in the least. Quite unusual. Is likely to appreciate it for those who add forums or something, site theme . a tones way for your client to communicate. Excellent task..
Hello there. I found your website by means of Google even as searching for a similar matter, your web site came up. It appears to be good. I have bookmarked it in my google bookmarks to visit then. Hi there. I found your blog by means of Google at the same time as searching for a comparable topic, your website came up. It appears to be great. I have bookmarked it in my google bookmarks to visit then. Fantastic goods from you, man. I have understand your stuff previous to and you’re just too great. I actually like what you’ve acquired here, really like what you are saying and the way in which you say it. You make it entertaining and you still take care of to keep it smart. I can not wait to read far more from you. This is actually a terrific web site. Hello there. I found your website by means of Google whilst searching for a similar subject, your website got here up. It appears good. I have bookmarked it in my google bookmarks to come back then. Hello there. I found your web site via Google even as searching for a comparable matter, your web site came up. It seems great. I have bookmarked it in my google bookmarks to come back then. Magnificent goods from you, man. I’ve understand your stuff previous to and you’re just too fantastic. I actually like what you’ve acquired here, certainly like what you’re saying and the way in which you say it. You make it entertaining and you still take care of to keep it sensible. I cant wait to read far more from you. This is actually a great website. Hi there. I found your site by the use of Google whilst searching for a similar matter, your website got here up. It appears great. I have bookmarked it in my google bookmarks to visit then. Hi there. I found your web site by means of Google while searching for a related subject, your site came up. It looks good. I’ve bookmarked it in my google bookmarks to visit then. Hey there. I found your web site via Google whilst looking for a related topic, your website came up. It appears to be great. I have bookmarked it in my google bookmarks to visit then. Hiya, I’m really glad I have found this info. Nowadays bloggers publish just about gossip and net stuff and this is really annoying. A good website with interesting content, this is what I need. Thank you for making this web site, and I will be visiting again. Do you do newsletters by email? Hi there. I found your web site by way of Google whilst looking for a comparable matter, your site got here up. It appears great. I have bookmarked it in my google bookmarks to visit then. Hey there. I discovered your web site by means of Google whilst looking for a comparable matter, your web site got here up. It seems to be good. I’ve bookmarked it in my google bookmarks to come back then. Hey there. I discovered your site by way of Google even as looking for a related matter, your website got here up. It seems good. I’ve bookmarked it in my google bookmarks to come back then. Hi there. I discovered your site by the use of Google while searching for a comparable subject, your web site came up. It looks good. I have bookmarked it in my google bookmarks to visit then. Hi there. I found your website by means of Google whilst looking for a similar topic, your web site came up. It seems great. I’ve bookmarked it in my google bookmarks to visit then. Hey there. I discovered your blog by means of Google whilst searching for a comparable topic, your site got here up. It appears great. I’ve bookmarked it in my google bookmarks to visit then. Hi there. I discovered your blog by the use of Google whilst looking for a similar subject, your website came up. It looks great. I have bookmarked it in my google bookmarks to come back then. Hiya, I’m really glad I have found this info. Nowadays bloggers publish only about gossip and net stuff and this is actually irritating. A good web site with exciting content, that is what I need. Thanks for making this web-site, and I’ll be visiting again. Do you do newsletters by email? Hey there. I found your site by way of Google at the same time as searching for a similar topic, your website got here up. It seems to be great. I’ve bookmarked it in my google bookmarks to visit then. Hiya, I am really glad I have found this information. Today bloggers publish only about gossip and internet stuff and this is really irritating. A good blog with exciting content, that is what I need. Thanks for making this web site, and I’ll be visiting again. Do you do newsletters by email? Hi there. I discovered your blog by means of Google at the same time as looking for a comparable topic, your website got here up. It looks great. I have bookmarked it in my google bookmarks to visit then. Hey there. I discovered your site by the use of Google while searching for a similar topic, your website got here up. It seems good. I have bookmarked it in my google bookmarks to come back then. Hi there. I discovered your site via Google whilst searching for a similar subject, your website came up. It seems great. I’ve bookmarked it in my google bookmarks to come back then.